FANUC develops cutting edge CNC and motion control systems for machine tools and other non-traditional applications that are continually specified by machine operators and end users around the world. FANUC CNC controls offer the lowest total cost of ownership, optimized speed, nanometer precision and accuracy, a simple and user friendly operation, fast shop floor programming, extreme reliability with crash protection, built in backups, automatic servo and spindle tuning, fully digital system, integrated PMC/PLC, Drive systems, robot interface, flexible application for customer specific adaptation, Open CNC, iPendant, Dual Check Safety, energy saving, NC Guide, and more! Contact us to learn more about how CNC controllers can make your machine operations more productive and profitable. 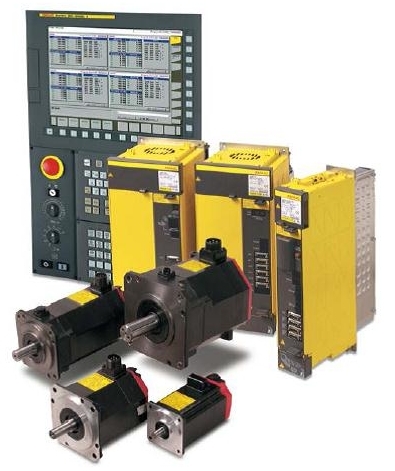 With millions of operational CNC controls in the field, there is a FANUC controller perfect for your applications. We integrated this LR Mate robot onto a periphery grinder that we remanufactured to modernize our customer's needs and specifications. This robot is slowed to 25% of its speed to show the accuracty and precision of the control.